Bvlgari Man Extreme All Black Limited Edition declares its excellent taste. 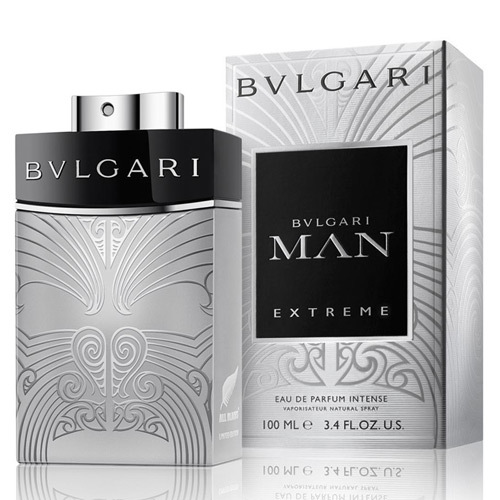 Bvlgari Man Extreme All Black Limited Edition 100ml. EDP is a spice-flavored scent. You can enjoy fresh cacti juice, pink grapefruit and refreshing bergamot. Man Extreme Intense perfumed water develops in medium tones of cardamom, freesia and amber, and uses the basis of benzoin, Haitian vetiver and woody tones. The limited edition of Man Extreme All Blacks captivates you with its narcotic aroma. It will give you confidence and highlight your individual style. Become a man who rejects social conventions and get out of the crowd. Perfumed water will pick up your unbounded character and surprise you with a magical effect on the senses of women. The scent of Man Extreme Intense is hidden in a stylish silver bottle with a luxurious relief and a distinctive Bvlgari sign. Toilet water was launched in 2015. Bvlgari presented the toilet water Bvlgari Man Extreme in such a courageous dark gray bottle. The fragrance will suit everyone who is already familiar with the classic scent of Bvlgari Man, and all those who have not yet ventured to do so, but confidently want to experience the extreme freshness of the new fragrance. Italy - the manufacturer of toilet water Bvlgari, keeps from century to century its majestic history, full of courage and an intense palette of feelings, as well as more than one legend about the alliance of beauty, charisma and courage. The fragrance of the famous fashion brand best suits such a type of men who are not afraid of anything, ready to always go to the finish and even further. The fragrance inspires to open a new road, to break through personally when it's needed. The notes of the Bvlgari Man Extreme toilet water truly cleverly combine classic notes with a perfume melody inspired by oriental sagas. A man who chooses this particular flavor will be inspired by the exploits and will feel his powerful mood always and everywhere to be on the leading positions. All these power roads do not exclude feelings and, of course, waves of freshness. Not only the quality filler, but also the jar itself, like a monument of stone and metal, will give the man a sense of fortitude.